CharyJay.com: Winners of the T-shirt Giveaway by Cotton Candy Playground Apparel! Winners of the T-shirt Giveaway by Cotton Candy Playground Apparel! Thanks to everyone who participated in my first joint giveaway with Holly of CurlRehab.com! It was definitely a pleasure teaming up with one of my favorite bloggers and Twitter Followers (they should seriously look into making a friendlier word for "followers"). 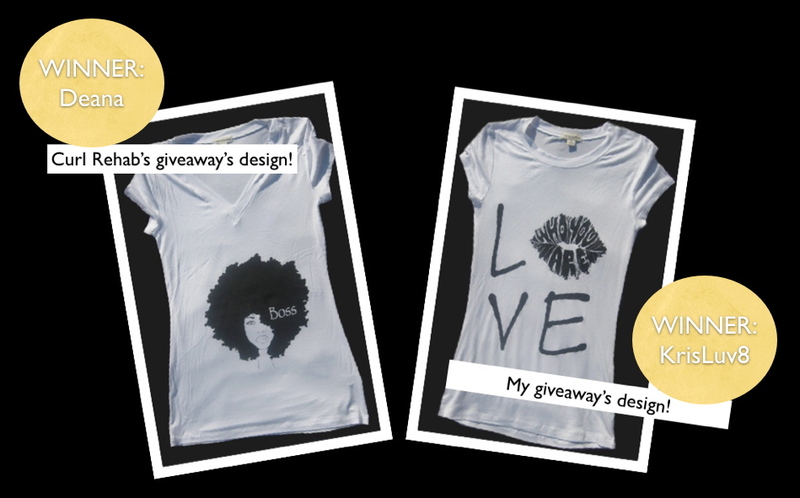 is winner of the "Love Who You Are" T-Shirt, which was given away on my website. is the winner of the "Boss" T-shirt, which was given away on CurlRehab.com. You have 48 hours to claim your prize. If you do not respond within that time period, another winner will be chosen. A huge thanks goes out to Nicole Updegraff for sponsoring this giveaway. I LOVE my shirt and I'm sure you ladies will love yours as well! Stay tuned for more giveaways...they are coming your way really, really soon! Yay! Can't wait to wear my Boss shirt!! Thank you for hosting this giveaway! Is there any other info you need? Can't wait to receive my Tee so I can rock it!